Long-time friends of Charles McDowell, Betty and Roger Ruch were instrumental in the founding of the McDowell Center for Critical Languages and Area Studies. The couple from Hurst, TX, had made a comfortable living working for American Airlines and had plenty of opportunities to travel and see the world. In 1970, they proposed to Dr. McDowell that they host a student from the Soviet Union. Over the next three decades, with McDowell’s help through his expertise in the Russian language, culture, and politics about the Soviet Union, they opened their home to twenty-eight students. Betty and Roger furnished apartments for their visitors, helped them navigate through official American channels, donated and loaned the students money, and generally made a lasting impact on numerous lives. The Ruchs’ private exchange program proved invaluable for what was then called the Center for Soviet (later Post-Soviet) and East European Studies. Many of these students became alumni of UTA’s Russian language and other Liberal Arts programs, as well as graduates of the Colleges of Business, Science, and Engineering. The Ruchs’ hope was that these young people would be able to take the ideas they learned in the United States back with them to their homeland and somehow make a difference there. And because of the contacts these visitors made while living in the U.S., numerous UTA students and professors have been able to travel to Russia themselves and experience a part of the world that certainly is “critical”. Roger Ruch passed away in 2005. In 2011, he was followed by his wife Betty but not before the couple left yet another indelible impact. It had long been a goal of the couple to establish an academic program on campus and the opportunity finally presented itself. 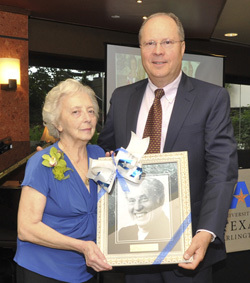 In April 2010 Betty made the second largest gift ever to the College of Liberal Arts for an endowment to support the Center in the name of the couple’s good friend, Charles McDowell. As a response to their generosity the Center has in its turn named the Study Abroad Scholarship program in their honor. The first Betty and Roger Ruch Study Abroad Scholarships were awarded in Spring 2011 to students studying in Russia, Turkey, Morocco, and Jordan.